The Temple of Karnak is the largest and one of the most visited temples of Ancient Egypt. It was founded in 3200 BC by the Pharaoh Senusret I. Building on the temple continued for over 3000 years throughout the history of Ancient Egypt. Around 30 different pharaohs had a hand in the construction of the temple. 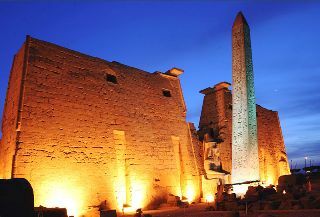 Karnak is located in southern Egypt in the ancient city of Thebes (inside the modern city of Luxor, Egypt). The temple was built to house the god Amun along with his wife Mut and his son Khonsu. The most famous section of Karnak is the Hypostyle Hall. The hall is 50,000 square feet filled with 134 huge stone columns. The twelve center columns are 70 feet tall! The hall was built by Pharaoh Seti I around 1290 BC. About a mile and a half south of Karnak in Luxor, Egypt is the Luxor Temple. It is located on the east bank of the Nile River. The temple was built around 1400 BC for the god Amun along with his wife Mut and son Khonsu. Each year the temple would host the Opet festival. During this festival the statue of Amun would be paraded from the Karnak Temple to Luxor. The Luxor Temple is known for its large statues of the Pharaoh Ramesses II, an 80 foot tall red granite obelisk, and the Avenue of the Sphinx. There used to be two obelisks at Luxor, but one now resides in Paris, France. The Abu Simbel temples are located on the southern border of Egypt. They were originally built by the Pharaoh Ramesses II as a monument to himself and Queen Nefertari. The temples were built between 1264 BC and 1244 BC. They were relocated in 1968 so they would not be flooded by the Aswan Dam. There are two temples at Abu Simbel. They were originally carved out of solid rock. The larger of the two temples is famous for four giant statues of Ramesses II that guard the entrance. Each statue is 65 feet tall and the total height of the temple is nearly 100 feet tall. The Temple of Edfu is located on the west bank of the Nile River in the city of Edfu, Egypt. It was constructed during the Ptolemaic Dynasty between 237 BC and 57 BC. The temple was dedicated to the falcon god Horus. This is a mortuary temple built by the female Pharaoh Hatshepsut around 1470 BC. The architecture of this temple is considered unique and a turning point in the history of Egyptian architecture. The temple was dedicated to the sun god Amun-Ra. It is located to the northeast of the city of Luxor, Egypt near the Valley of the Kings. The Temples of Philae are built on an island in the Nile River. There are a number of temples on the island built over a long period of time by the Pharaohs, the Greeks, and the Romans. The main temple on the island is dedicated to the goddess Isis. The temple of Kom-Ombo is located in southern Egypt in the town of Kom Ombo. It was built during the Ptolemaic Dynasty between 180 BC and 47 BC. The southern part of the temple was dedicated to the crocodile god Sobek and the northern portion to the falcon god Horus. The Temple of Seti I is a mortuary temple built for the Pharaoh Seti I around 1280 BC. It is located in the city of Abydos, Egypt. It was constructed in the shape of an "L" and has shrines dedicated to six Egyptian gods including Osiris, Isis, Horus, Amun, Ra-Horakhty, and Ptah. There is also a shrine to the deified Seti I.